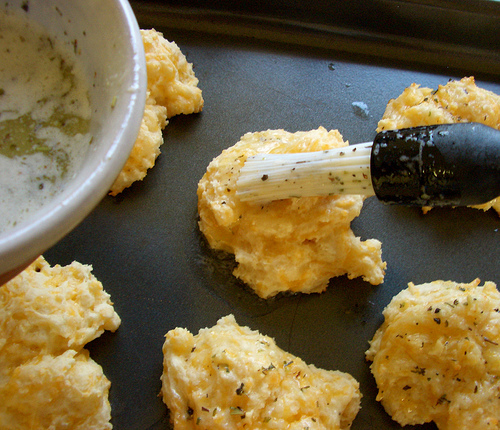 Copycat Cheddar Bay Biscuits Recipe (Red Lobster) - THE one. Here is the copycat recipe for Cheddar Bay Biscuits from Red Lobster. It’s easy and so delicious. It’s the one you’ve been looking for. 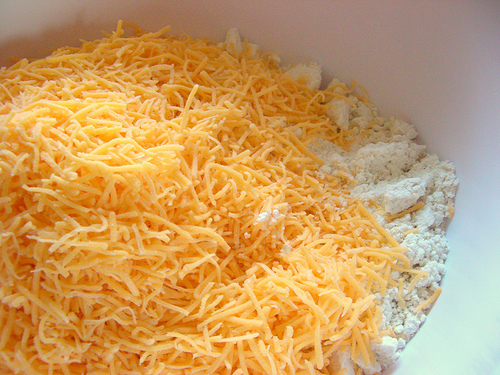 Dump into a bowl: 2 cups of buttermilk biscuit mix (like Bisquick or Jiffy mix ), 1/2 a teaspoon of garlic powder, and 1 to 1 1/2 cups of shredded cheddar cheese. It gets pretty thick, and you can add a little more milk if you need to. But don’t add too much, otherwise it’ll get really sticky. See how my spoon is standing up straight by itself? I decided it would be easier to doff my rings.. Stick them in the oven and set the timer to 10 minutes. Now, melt 2 Tablespoons of butter and stir in 2 teaspoons of oregano (or parsley if you don’t like oregano) and 1 teaspoon of garlic salt. If you’re having people over, you’d better double the recipe. These will get snatched up like hotcakes. 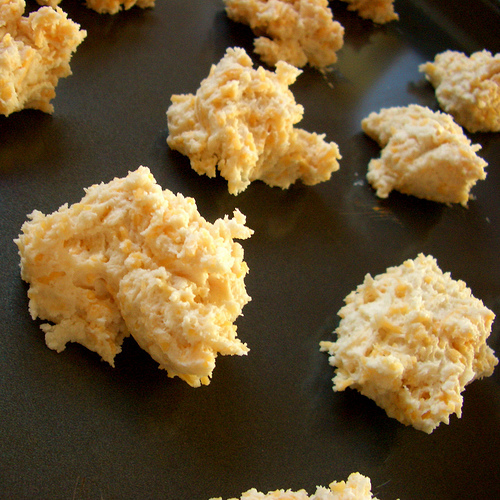 Or, you know, like… Red Lobster’s cheddar bay (copycat) biscuits. Want the printable recipe? You’ve got it! Keep scrolling. 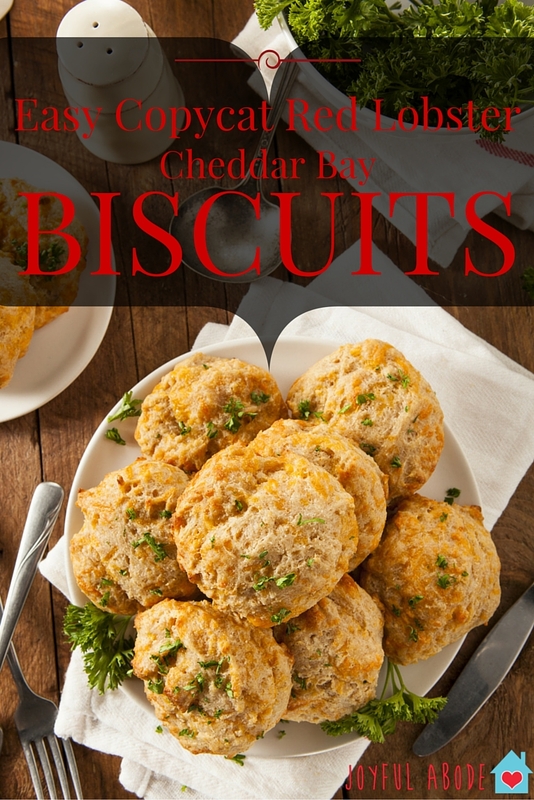 Do you like this Copycat Cheddar Bay Biscuits Recipe (Red Lobster)? Don’t forget to Pin it! 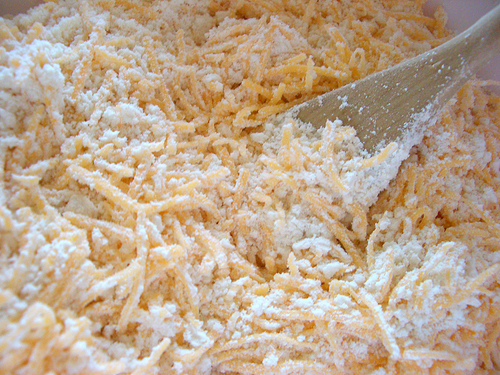 Mix biscuit mix, garlic powder, and shredded cheddar cheese. Add the milk. Stir until combined. Drop lumps of dough onto your cookie sheet, spaced about 1.5 inches apart. Mix melted butter, herbs, and garlic salt. When the timer goes off, brush the butter mixture over the biscuits and return to the oven. Bake another 5-6 minutes or until lightly browned. Optionally, brush with butter mixture again when they're done. This recipe was originally published in March 2008. It was updated in November 2015. Oh my goodness. THIS. When i was younger, I requested Red Lobster for every single birthday and those biscuits are at least half the reason why. Yum, these biscuits look delish! Thanks so much for sharing your yummy recipe on the Monday Funday Party! Ok, those are my absolute favorite! I can’t wait to make them! I loved how easy this was. In an effort to find something to make with what I had on hand, I found this through pinterest. I wound up taking small single serve pie tins and placing sausage on the bottom then scrambled some eggs to pour over and topped with dollops of the dough from this recipe. My boyfriend and I decided this will definitely make a comeback in my kitchen! commenting down here in the comment section! Simply just desired to mention u really did a terrific work. I made a dozen good sized ones. Looks delish..what brand of milk do u use or what milk do u use? These biscuits look amazing and from the recipe I am sure they would be divine. Your instructions and the photos are great. I do have a question though, why do you use Bisquick Mix or Jiffy Mix? You have a great blog and you can obviously cook, so why use the crutch. When we cook from scratch we know exactly what is in it, I haven’t seen a box of Bisquick in years and I don’t really know what they are putting in it now but most products like that have junk we don’t need. Biscuits are not hard to make using flour and it is not a big time saver. My recent recipes are grain free (we eat primal/paleo now) and more from scratch, so I hope you’ll check them out! Sorry i didn’t really notice the date. I am glad that you are doing what you feel you need to do to be healthy. I don’t think I will ever go grain free but I can understand why someone might. I do my best to eat healthier grains and limit how much I eat, I will definitely check out your later posts. You showed pictures for how you make the red lobster biscuits. In one pic you took your rings off to make the dough. 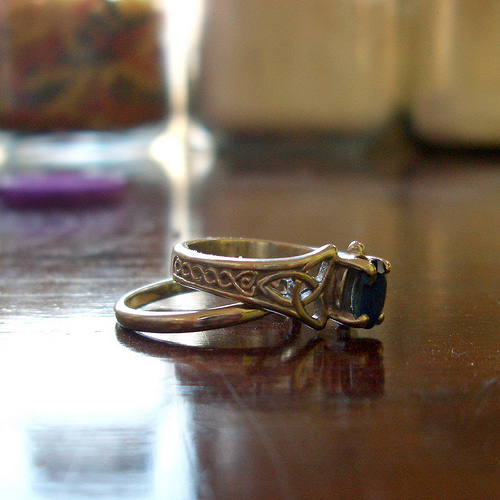 I can’t stop admiring the beautiful Celtic band on your ring. I just love it. Was it custom or could you possibly tell me where I might purchase that band or one similar? I also LOVE your celtic ring. Can you please share where you got it? Simple and delicious!!! I used parsley instead of oregano. Thanks for sharing! OMGosh! I made these tonight and Hubby and I ate these over the Chicken Alfredo I made to go with them. These are the real McCoy everybody! Yum! Thanks so much for sharing! Ohhh K so I never post, but I just have to say that my 17 year old daughter is a red lobster bread fanatic, I mean she would go to red lobster at least 3 times a week just to by a dozen breads,. But she’s tight with her money (yeah!!) so she found this recipe, and needless to say I thank you for sharing , they are GREAT!! I thought I had left comments a couple years ago but couldn’t find them. I am now making these biscuits for like the 15th time. I have to thank you for this recipe and the great pictures. These have quickly become a favorite among my family and friends. They are even better than Red Lobster!!! I don’t use as much oregano. I put a little pinch of oregano and a couple pinches of parsley. Enough to give the biscuits a pretty green sprinkling. I usually make these when I make Rachel Ray’s pecan crusted chicken, Pictsweet frozen corn and usually a yummy dessert. Every time I have made these my friends have stole the leftovers. Thank Emily! I am SO trying this tonight! Along with marinated Skirt Steak, White Rice and Peas w.Mushrooms (YUM!) Thank you SO much for sharing!!!! i think putting it at 350 degrees is better because the first time the bottom got really burnt, but this time they were absolutely perfect, great recipe! but instead of the oregano i used fresh parsley, yum! 350 for the same amount of time? Good idea with the parsley! 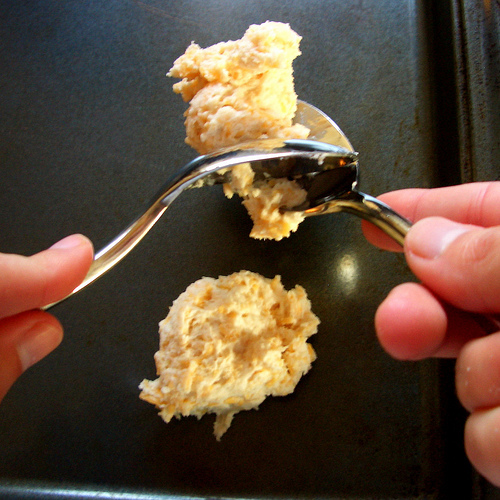 How many it makes depends on the size of spoons you use to measure out the dough. Use half as much garlic powder instead of garlic salt and then lightly sprinkle tops with kosher saly IF DESIRED. That should take care of the salty tase. OMG! These were awesome! It’s a good thing I made a very light Maryland crab soup to go along with them, because I ended up eating three! My husband says these are way better than the ones at Red Lobster. I actually added a 1/4 tsp Old Bay to the mix. I think that’s the “bay” part in RL’s Cheddar Bay Biscuits. I was out of oregano & usually don’t keep garlic salt, so I subbed a salt-free herb & garlic spice blend in the butter mixture. Maybe that’s why we didn’t find them to be salty like some of the other reviewers. So, so good!! How many biscuits does this recipe make? Thanks! I just got done inhaling 5 of these biscuits for the first time. Delicious! I used less than half a teaspoon of garlic salt with the buttery topping and they were still too salty. Next time I’m going to use garlic *powder* instead and just give them a little sprinkle of regular salt. Also, instead of oregano, I used dried parsley flakes since that’s what it looks like they use at Red Lobster. this recipe is too salty, to dry…and doesnt say what tempature to put the oven on…..
Must be something wrong with way you made them because these are a major hit and several friends have asked me for the recipe. You kind of have to keep an eye on them because not all ovens bake alike. Also varying altitudes can affect them as well. I encourage you to try to make them again! If you use crushed oregano leaves, use the amount suggested. If you use ground oregano, use half. crushed leaves are great and look great! too salty, try 1/2 tsp of salt and 1 tsp oregano. I always use ranch seasoning mix with my butter when I make these! I just made these tonight and they came out great! Like some of the other posters mentioned, I used parley instead of oregano in my butter mix and they came out soooo yummy. Thanks for sharing! I’ve made a similar recipe, but it calls for parsley instead of oregano. The “Red Lobster” biscuits do not have oregano. I made these tonight but my buttery topping was almost black due to the 2tsps of oregano. I wish I had left it out completely. I think the butter and garlic salt alone would have been delicious. Otherwise very good! Wow! Wait until I try these for my mom and dad. I think these were my best memory of Red Lobster in the 90’s. Thanks so much for sharing this. I’m crazy about the Red Lobster biscuits, & I’ve been looking for this recipe. Can’t wait to try it. Wonderful recipe! Thank you so, so much for posting. My fiance and his friends loved these. I would advise greasing your cookie sheet with some Pam or equivalent spray. These will stick a bit. I used a small ice cream scoop that has that metal thingy that goes around the edge when you press the lever to form them and didn’t have any problem at all shaping them. Combine all ingredients in a bowl except shortening. 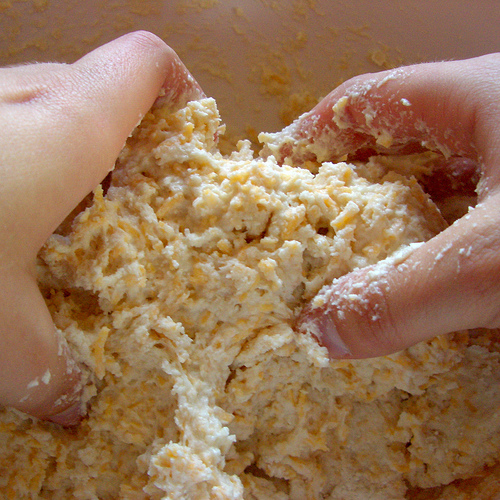 With pastry blender cut in shortening until mixture resembles coarse crumbs. Use as you for baking mix. Enjoy! This recipe looks mouth watering. The garlic cheesy biscuits seem to compliment the lobster well. Perhaps its time to get a food brush. These are great! I used a little bit less oregano in the butter mixture and I still had a lot left so next time I will just use one teaspoon instead of two. Thanks for sharing! Way too much oregano. I’m going to use 1 tsp next time, at MOST. Otherwise… Delicious. this looks great but a little messy for my taste. i don’t know if i have the patience to make this dish .. I really like the look of these, but I’m from New Zealand and Besquick biscuit mix doesn’t exist down here, as far as I’ve seen. What’s an alternative I could use? This is so good and they turned out perfect the first time. Thank you so very much God Blessand keeep thee. Can i make these ahead and just reheat?? or make the dough a day ahead and bake in the a.m.? Thanks so much for this. And thanks for saying “a la” instead of “alla” — drives me nuts. I will try this over the weekend. Thank you! Just what I needed to add to tonight’s dinner. Thank you so much for this recipe! 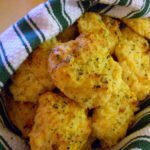 I tried it recently, and it’s the best imitation recipe I’ve found so far for those delicious cheesy biscuits. Keep up the excellent work! Oh wow! I’ve always loved those things. I’m stoked to give this a try! tried these and loved them! 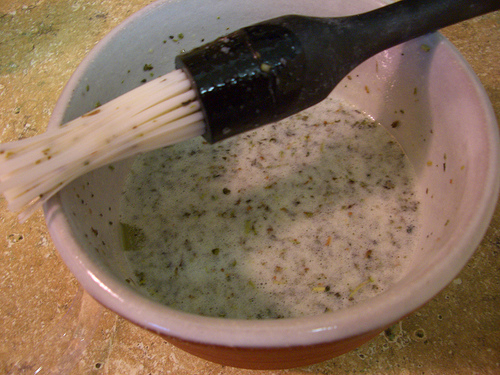 I went a lot lighter on the oregano – only a smidge – and added some dried parsley to the butter, mostly for color. so, super easy, super fast, and super yummy! I just made this biscuits for my family as part of our Valentine’s Day dinner, and they were a big hit. I already got request for them for tomorrows dinner. Quick and simply to make and they taste really good.. Im glad i tried them. I made these last night when I had some friends over and not only was this recipe easy to make, they were also devoured in about five minutes. Thanks for this awesome recipe that I was able to cook-up on a college student’s budget! I don’t use baking mixes, so I added the extras to a standard buttermilk drop-biscuit recipe, they turned out great. Ate at RL this weekend for our anniversary in Branson MO. Love the Biscuits, told my husband I had to find this. Will try yours for sure. I said they were manna from Heaven. 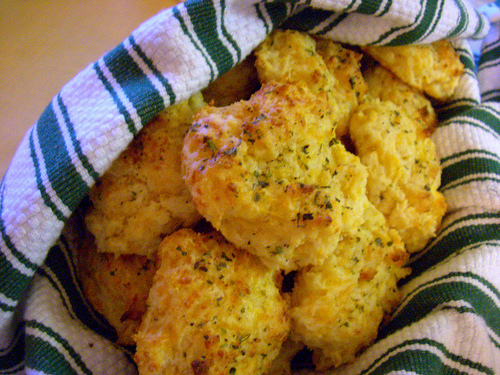 I just made the cheese biscuits tonite–they were a huge hit at the dinner table. My son who is the pickiest eater ever had 3 of them. The only thing I’ll change the next time is not to add oregano with the butter. I’ll probably make these at least ohce a week—they were delicious!!!! I just made these. they were great. I do think ranch mix with butter might be alittle closer. I will try that next time. Thanks for sharing. Wow – that was great! Makes me hungry just looking at them! These look great! I can't wait to try them. Thanks! Wow that look very tasty thank you for sharing. Been wanting this recipe! My favorite item at Red Lobster; thank you for sharing. You can find the cajun shrimp pasta recipe at the Darden Restaraunts homepage! If they removed it, use the link and request it. They are happy to share it with you. Enjoy! Which ones for olive garden do you have? I am looking for the gnocchi chicken soup recipe. What was it that you hated about the recipe, Jessica? Seriously, I need to know. I’m making them for company. Hey william – I think your guests will like them. Some people think they are too garlicky or if they don’t like oregano, they may not like these… but everyone I’ve made them for has LOVED them, and as you can see, many people in the comments raved about them. If you think it sounds like too much garlic , use less. If you don’t like oregano, try parsley. You can “edit” the recipe for your liking. she is just posting that to either be difficult or it’s just her preference in taste. Really? Then you are the minority to this group because these are absolutely awesome! Why did you feel it necessary to post three times that you hate them. Kind of strong words. You could have stated something like too garlicky for me or too salty. You can give your opinion without being so rude! I love what I see so far and I do love to bake! By the way, it is definitely 2 T.parsley, but no shortening, ranch dressing or sugar! YOU DID'T WRITE HOW MUCH MILK OR BUTTERMILK OR WATER TO USE AT THE BEGINNING. FOR ME TO GET THE CORRECT MIXTURE I THINK IT IS IMPORTANT TO KNOW. PLEASE ADD THAT INFORMATION TO THE RECIBE. THANK YOU VERY MKUCH , BUD H.BELEN, NEW MEXICO. I love your recipe. I made these for my family and they were gone in minutes. I didnt have any oregano so i used my favorite herb dill and they were delish. I also put a teaspoon of minced garlic in with the biscuits. I'm definitely going to try the recipe, but I have a question for the chef. If those are your wedding rings where did you get them? They are very pretty. Haha agreed! I worked at Red Lobster too and when I read that I just laughed!!!! Sorry about your confusion Jimmie, but definitely no can! Wouldn't that be more work – having to work in cheese and herbs into each individual biscuit? Canned biscuits don't have all this yummy goodness! Yoou are right, it is parsley. If you are talking about RL biscuits…out of a can???? I have worked for them for over 10 years….no” can” buddy….ridiculous! I made these biscuits last night. WOW. I almost finshed the whole pan before my boyfriend got home from work. I managed to save him one. He loved them as well. Best biscuit I have ever eaten. Hands down. I will make these again and again. I only changed one thing I used parsley and Basil because I had no oregano on hand. delish! Feed them to chickens,find some friendly neighborhood ones, chickens love bread! Definitely try the red pepper soup – regardless of whether you use the biscuits on/with it or not! It's sooooo good. And thank you for asking – I am doing quite well. I came home from work today to an amazing-smelling house and a husband cooking me brisket!!! And I just had a couple sips of a yummy merlot. I'm a happy camper. mmm, chicken pot pie filling! that sounds delicious, i think i'll try that, thank you so much! i was thinking it might also go well crumbled over the creamy red pepper soup – heeey! think i'll try both this weekend! hope your doing well! ohhhh noooo! So sorry they came out that way for you. Yeah, the original recipe is already plenty salty (I'm a salt lover) so more than that wouldn't be so good. Maybe you could make something like chicken pot pie filling (or a thick soup/stew), and bake it by itself, but serve it with the biscuits crumbled on top.. that way you could let the saltiness distribute through the filling/soup flavor because you'd be eating spoonsful of soup+ a little bit of biscuit in each bite. i was so excited to try these, i actually made them at at 2am! but, alas, i am a cheese lover & added extra cheddar & some parmesan – wrong, so wrong!! they came out way too salty *ugh* next time i'll stick with your recipe! in the meantime, any suggestions on what i can do with these super salt-i-licious biscuits? (i spent 10 years in a third world country, i refuse to throw food away if i can absolutely help it – it hurts my heart) any suggestions would be appreciated! The real secret is that they dont actually make them from scratch. The biscuts come out of a can. Pillsbury I think. Red Lobster is one of my favorite restaurants, although I haven't eaten there in a long time. However, a friend of mine recently gave me a coupon and told me that the restaurant has just added 3 new Mediterranean flavored dishes to their already mouthwatering menu. Just ate there again, (Randall Road in Geneva, IL) for about the 35th time. Haven’t had a bad meal or service yet. I’m sure I won’t. Yes, I use the coupons Discover card sends me. @gimiecoffee OUR NEXT PROJECT BABE! This recipe is actually on the bisquick box. Been making them for years. Before my friend Howard and I worked together at a restaurant in Maryland, he had managed a Red Lobster. He knew how to make these biscuits, and used to make them for the staff, who gobbled them up. His ingredients and procedure almost exactly matched yours, although he did use parsley and not oregano, but I don't think that's awfully important–it's mostly the cheese, butter,and garlic. Howard never added any ranch dressing mix, but I guess there's no harm in that–it is tasty stuff. For those of you who can't get Bisquick or Jiffy mix or whatever, here's a DIY version. No offense to the good people at Bisquick or Jiffy or whatever, but it's just as good, and cheaper. Mix it all together until it looks kind of crumbly, and keep it in a sealed container. It'll hold for quite a while–months, at least. I made these with dinner and the family loved them will definitely make these again! Excellent! I'm glad you liked them. I just tried this recipe and they were amazing! Thanks so much for it! Thanks for sharing this recipe hunny! This biscuit is the Only reason I would want to go to Red Lobster restaurant every once in a blue moon! I love the biscuit and I always greedily ask for a “to go” bag with a couples of buiscuits!!! I definitely need to try this at home sometimes! Thanks for the wonderful pictorial step-by-step instructions! yum those look awesome, i should try that! Those biscuits are perfect! I think they tase super! that ring is beautiful, absolutely beautiful. and the biscuits looks tasty. but I mean it, awesome ring. Haha, no but that's a good idea. Sometimes when I need “action shots” I ask my husband to help me take pictures. 🙂 He's a fantastic helper and knows to take a million shots so that at least a few will be usable. How did you take those pictures? Did you tape a webcam to your head? I just tried these and they taste JUST LIKE the ones at red lobster! Couldnt be more pleased with them 🙂 thank you for posting!! Glad you like them! You are so welcome. Thank you for posting the recipe. i can’t wait to make them with my next dinner! 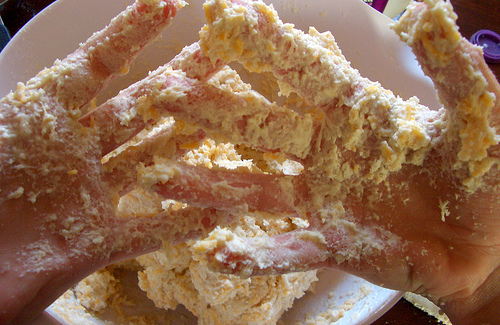 Arenda, the recipe should make about 12 biscuits. And I would recommend using parchment paper rather than greasing a cookie sheet. I made them tonight and it’s hard to keep away from them – they are addictive!! I just went to the Red Lobster website and they have apparently noticed that none of the “guesses” of the recipe on the web have added baking soda to which they recommend doing so. And I don’t believe that oregano is correct, it’s parsley. I read through the comments, but no one seems to ask this. How many does the recipe you used make? I will be making these today> Thanks for the recipe. These look freaking delicious! Thank you so much for sharing, no longer do I have to go to Red Lobster when I crave these biscuits. I could probably make 12 batches for what a dinner at Red Lobster would cost! How much do you want for your ring? Or where can I find one like it? I just tried the biscuits and yum, yum, yum!!!! Thanks so much for sharing and I’m serious about the ring!!!!!! I found your website last night and just finished making these yummy biscuits! My husband is in heaven! They were great! I just used your recipe and made these biscuits and they are soooo good. I enjoyed your pictures and the instructions were so easy to follow. I’m going to surprise my husband with these and some crab legs, salmon and fresh corn. I bet he’ll appreciate every last bite!! Thanks for the recipe! Combine flour, milk, baking powder and salt. Cut in shortening. Store in tightly closed container in cool place. Please, what is inside of that buttermilk biscuit mix. I am in Croatia and here is very unusual to make food with pre-prepared mix. Many thanks. …it’s not oregano, or parsley, it’s powdered RANCH DRESSING! You mix it in with the butter. mandy- you are probably at a different altitude. I’ve moved around a bit and noticed that i have to alter recipes a little for different altitudes. i would try cooking them at a lower temp. not too much though. Ahh! These look absolutely delicious! Great recipe! Those look so yummy. Seriously sinful. I gotta make some. I wouldn’t be surprised if the mix had dried milk in it, though. I’d imagine the contents of the bag was something like biscuit mix, garlic powed and dried milk. It also looks like you used a bit too much cheese in the mix. They do use the finely shredded variety in the recipe. 1. Put all ingredients into bowl. Mix it, but not too well. Your picture looked about right before you went hands on it. 2. Fill up the sheet. At RL we’d use a potato scoop as mentioned above to get consistent biscuit sizes. 3. Put them in a Convection Oven for about 3 minutes and then turn and cook three more minutes. 4. Brush each biscuit w/ a mix of Butter, Parsley and Garlic, also known as Scampi Sauce w/o the White Wine. Mandy, I have no clue… did you change the recipe at all? Every time I’ve made these, dry is the LAST word I’d use to describe them. Are you sure your oven’s thermostat is correct? Maybe it reads one temperature but it’s actually hotter than that… I’m really not sure. i made these tonight and they came out very dry- any clues on what i may have done wrong? thanks! Has anyone tried freezing these? I often like to cook ahead and freeze. Derek, sometimes I’ll call my husband in to take pictures for me… he puts his arms over my shoulders and holds the camera that way. HAHA. They look delicious. But how did you take a picture of both of your own hands. Lol. some advice for those wanting them to come out like RL biscuits, use a potato scoop, you know the things that look like ice cream scoops with the scraper. Thanks for posting this, I’m making these for thanksgiving! 1. To remove a hat as a greeting or mark of respect. 2. To remove or take off, especially of clothing. I made these to the letter and let me say Thank You. They are great! Exactly like Red Lobster’s. This is a great little recipe that is perfect for a cooking neophyte such as myself! I’m now off to market to buy some Bisquik mix! These were SOOOOOOO quick and easy to make! They filled the house w/a warm garlicky smell! And they tasted BETTER than Red Lobsters! Thanks so much for the recipe!! I’d like to know where you got such a beautiful celtic ring. I’ve never had these before, but they sound really good! I’ll definitely be making some. These look incredible, and so easy! And what a beautiful ring! I love the gaelic knot design! Thankies! I was putting the garlic in with the dough and kept wondering why they tasted nasty. 🙂 Butter + Garlic = No burnt garlic tasting biscuits…duh. I’m a genius sometimes. I am so going to try make these. Hubby loves RL’s biscuits. Thanks for sharing! Just what I needed… fantastic cheddar biscuits IN MY HOUSE! Oh, this is so on the Thanksgiving table. I do think I’m going for parsley over oregano. It’s a fine line with oregano. Thanks for the recipe. Glad you liked them. I think Red Lobster probably uses parsley instead of oregano, but I prefer oregano… try parsley next time! I stumbled on this a few days ago, and shared the recipe with my ex later that night because i knew how much he liked the Red Lobster biscuits. He made them immediately and said they were fantastic, but to use less oregano. So, I started my own batch last night, only using 1 tsp of oregano (half of what the recipe calls for), and it was still too much for my tastes. Maybe different brands of oregano have different potency? They were still amazing, however! Thanks so much! Wow, these look great. Thanks for sharing. Those look good but if you wanted the actual recipe you could have just gone to barns and noble they have a book that has all of the favorite recipes from many of the top resturants. This was superb, they taste better than the red lobster biscuits. Thanks so much for sharing this! This recipe is now on my to cook list. They sure do look scrummy. But what you really sold me on was that ring. I adore it. And now back to those “healthy” biscuits i really don’t need to know how to make. rats. too late. i do, now. These biscuits make my mouth water! Way too much garlic salt!!! Was 1 tsp correct? Maybe 1/4 tsp would be better? What a great recipe, thank you! I just finished making them and had to stop my son at biscuit #7. I’ve been on the computer for an hour and hope there’s still one or two left for me! Your triad ring is absolutely beautiful. If you buy Bisquick the recipe is on the box! I was so excited when I discovered that! Everyone loves Red Lobster cheesy biscuits. Yuuum! I will be makin’ these for my hubby this week! He will be so happy and those are the only thing he really wants there anyway. Thank you for the post! Can someone tell me what is this “buttermilk biscuit mix”? I live in Croatia, and we don’t have it here. What can I use instead? Thanks! Ty, could you ask your wife: Does Red Lobster make them from scratch, or do they get a pre-made dry mix to which they add the ice water? The latter is how many restaurants work, and if it’s true, the dry mix may already have milk powder in it, which is why they add ice water instead of milk. You got almost everything right, except there is no milk in the mix. My wife works at Red Lobster and she told me that it is ice water that is added to keep it from getting being to thick. Also the garlic butter is brushed on when they come out of the oven. Very impressive job though figuring it out. I’ve been waiting for this recipe!!! Thanks to you (and stumble) I’ve got it! OOOOO baby I’m going to get a stomach ache from the overindulgence I plan to partake in. These look lovely. Thank you kindly for sharing the photos and recipe! I make these all the time, using whole wheat flour w/flax meal mixed in, and fat free cheese. so they are a bit healthier. dont forget the parchment paper so you dont need to grease the pan ! OK, I had a busy Sunday planned. I just got busier this sounds great! These look amazing! I have made something similar, although without the herbs and metric buttload of butter. Yum! So that’s what i’ve been missing while avoiding all the seafood.. I once asked a waiter for this recipe and he said he couldn’t give it out because it was a secret. Fooled them huh? You have really nice hands. My kids and I used to fight over the cheddar biscuits at Red Lobster all the time (I’m so ashamed of myself!). These actually look yummier! I’m going to try these tonight! Thank you for the recipe! By the way, your ring looks beautiful… I love the design work on the side. Hi there! Just wanted to let you know that I loved this recipe so much that I included a link to it in a feature at a site that I write for, Blissfully Domestic. When I saw your first post about these I drooled and swore I’d figure out how to make these. Since you reposted I just haven’t had the time. I’m making them tonight though and am super excited to try it out! Those look perfect and scrummy! I’m sure the ones from Red Lobster have dried parsley instead of oregano, though. I’m NOT an oregano fan, and I would not like the ones from Red Lobster if I tasted it in them. I’m going to use your recipe tomorrow, except put in the parsley instead of oregano. Thanks! Just tried these, they were done in half an hour flat and they came out beautifully! I love how classy they look for how easy they were to do. My only comment would be that 2 tsp seemed like way too much oregano, and I’ll probably use a bit less in the future. Very nice, either way. I just saw this on tastespotting and had a wicked flashback. I’ve only been to Red Lobster once, when I was about 7, but I remember the taste of these things. I guess they made an impression! The heck with Irish soda bread… I’m making these for St Patrick’s Day! Hop on over to http://anapronaday.blogspot.com for my Kiss Me I’m Irish Beef & Cabbage. Want to know why they called it “corned” beef? Come on, I’ll tell ya…. My husband simply ADORES Red Lobster!! Sadly, his disability pension means that we can’t eat there anymore. But since the biscuits there were one of his favorite things, I’ll make them this weekend and try and pull him out of his downswing. Those biscuits look delicious! I may have to give them a try. I can’t say I’ve had the Red Lobster ones, (darn fish & shellfish allergies) But I will absolutely be giving these a try. And I simply adore your rings too! stormz, yes, it’s a powdered biscuit mix. If you have a recipe for dough for drop biscuits (not cut biscuits) using your own recipe-from-scratch would probably work just as well. 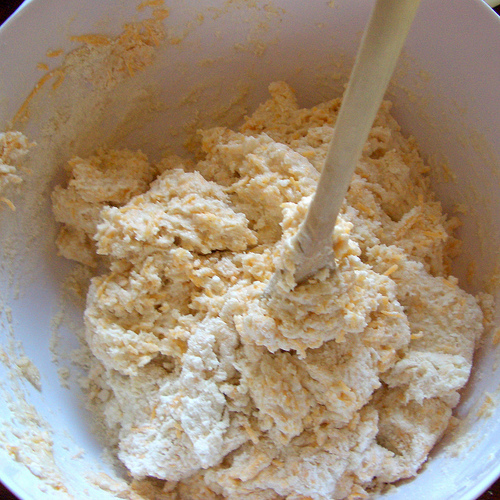 what is : buttermilk biscuit mix (like Bisquick or Jiffy mix), is it just some sort of powdered biscuit mix like you buy in the store? Oh my goodness I think I just drooled on my keyboard! Yum-o! Thanks for sharing this recipe! Caroline, yes he does. It would be really cool to have a third hand to do it… or maybe a tripod and telepathy-activated shutter. But he’s really sweet about helping. Miffy, welcome! Sara… you should try them out. They’re yummy. Stephen, what kind words. Thank you! Meagan, maybe a certain someone’s wish will be granted. Me and my friend Leslie were just talking like… yesterday… about how good Red Lobster cheese biscuits are, and how she likes them even better than Olive Garden breadsticks. We’ll have to make these. Does your hubby take your pictures when both your hands are in the picture? Thanks for sharing the recipe. They really do look like Red Lobster biscuits. Found your blog on the Apronista Flickr group & thought I would say Hi from Brisbane Australia 🙂 The recipes look great! Yummy…the efforts and passion you put in your blogging are clear. You have fun with it and that is refreshing. If you do everything with such fervour, the benefits and richness in your life are probably as good as this recipe looks. Thank you and I’ll certainly be back to visit. Mmmm maybe a certain someone might like these instead of Florida citrus when she comes to visit. I’m just sayin’.